I´ve been a big fan of archaic sperm whales since I read for the first time about Zygophyseter varolai in 2007. At that time, primitive sperm whales were still quite little known in general, and there were only a few life-reconstructions around. A lot has changed since that time, many new species have been described, and killer sperm whales have become much more well-known. 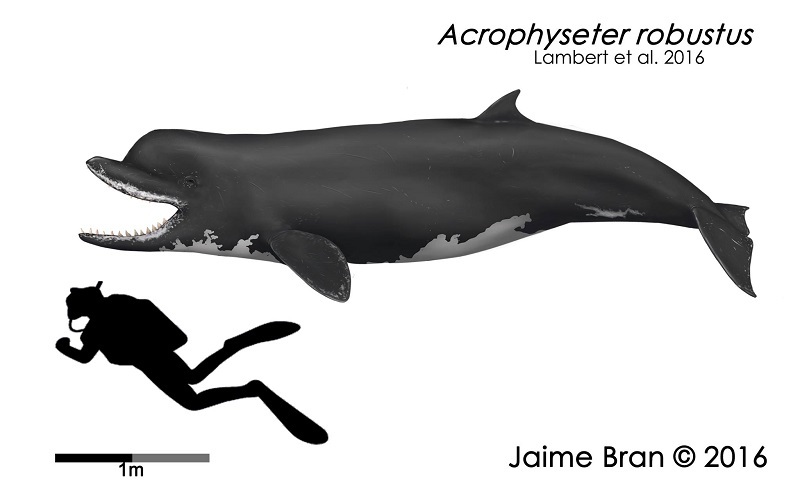 Just recently, a new killer sperm whale was described, Acrophyseter robustus from the late Serravallian–Tortonian of Cerro la Bruja, of the famous Pisco formation at Peru. The whales of the genus Acrophyseter were pretty weird beasts with no modern analogue. They had big heads, very strong and upwards curved Y-shaped jaws with formidable teeth and a cranial basin for the spermaceti organ that did not extend over the whole rostrum as in modern sperm whales. All in all, Acrophyseter must have looked quite different from modern sperm whales of the genus Physeter and Kogia. Jaime Bran made a very nice life restauration of Acrophyseter robustus, which gives you an idea about its appearance. Acrophyseter robustus was moderately big, around 4-4,3 m. That is well below the size of typical orcas and more around the size of the giant dolphins of Moray Firth. Despite their comparably small size, Acrophyseter robustus and related species like Acrophyseter deinodon were most probably not just piscivores or teuthovores as most modern odontocetes, but predators of marine tetrapods like marine birds, seals, smaller cetacans and perhaps also some of the weirder denizens of the Pisco-Formation like aquatic ground sloths and marine crocodylians. The difference is even more obvious when the skulls of Acrophyseter and Orcinus are compared in dorsal view. The jaws of orcas have the shape of a half ellipse and are quite broad. The jaws of Acrophyseter however are only broad in the distal area, but quite narrow on most of their length, not that different from those of modern sperm whales, but with proportionally huge upper and lower teeth. But despite those fierce teeth, Acrophyseter and other killer sperm whales possibly looked lesser scary in life than one could think. Most depictions of killer sperm whales show them with open jaws and fully visible upper teeth, and hardly anybody cares about how this would look when the jaws were closed. But what if they had upper lips which covered those teeth in life? This is really an issue. The very large and protrusive teeth of Acrophyseter could indicate that they were at least partially visible, even when the jaws were closed. On the other hand, nearly all modern odontocetes, even specie like false killer whales with very large teeth, have still all their upper teeth covered with lips. This enables them to seal their mouths against the surrounding water. 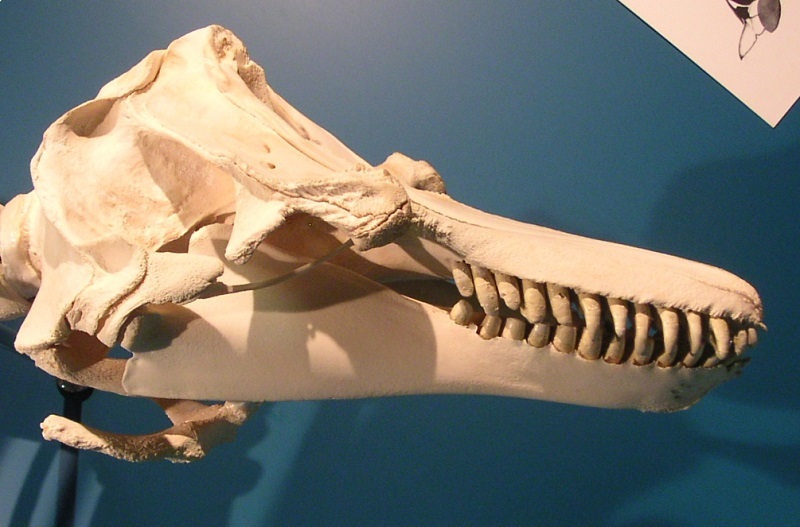 There are only very few exceptions like the Ganges river dolphin (Platanista gangetica), which has also extremely modified jaws. Jaime depicted his new Acrophyseter robustus with upper lips, and we had long and very interesting discussions about this topic. Here is one of the very few depictions which shows a killer sperm whale with closed jaws. It looks suddenly much more like a robust bottlenose whale and not like a toothy monster. Here is also a very old depictions of Zygophyseter varolai I did in 2007 (somewhat digitally modified because the picture quality was quite bad) with the upper teeth covered by lips. 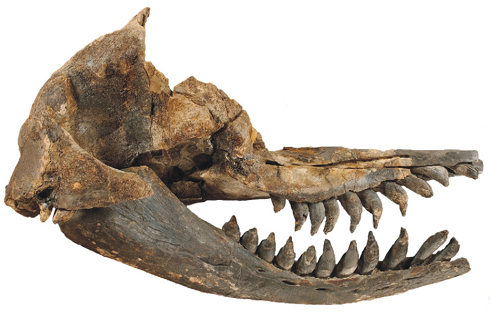 Unlike Acrophyseter, Zygophyseter had comparable straight jaws. 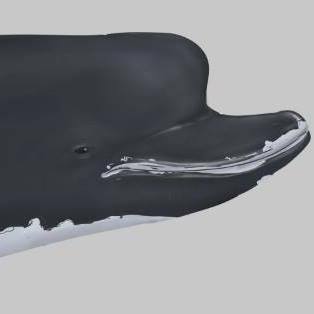 We will probably never know for sure how animals like Acrophyseter really looked in life, but I tend to think that upper lips seem more plausible. There is also perhaps the possibility that most of the teeth were covered, but the most anterior teeth were bare. There is possibly a chance that microscopic examinations of the teeth could help to solve this problem, to see if there is any indication for sessile ongrowth which could have only developed when the teeth were constantly surrounded by seawater as seen in many males of beaked whales or narwhales. There are often some typical errors in the depictions of killer sperm whales, like the position of the blowhole, which was almost certainly not at the most anterior part of the spermaceti organ as in Physeter, but in the area over the eyes, as in all other cetaceans, including pygmy and dwarf sperm whales. But this leads already to another topic which I want to discuss in a future blog entry about the gigantic killer sperm whale Livyatan melvillei. Lambert O, Bianucci G, Beatty BL. 2014. Bony outgrowths on the jaws of an extinct sperm whale support macroraptorial feeding in several stem physeteroids. Naturwissenschaften 101: 517–521. Dieser Beitrag wurde unter Paläontologie, Wale veröffentlicht. Setze ein Lesezeichen auf den Permalink.